Solar Shades can complement any room. A bright tangerine color can give your room a bold statement. Or choose a natural colored shade, to create an understated sense of style. These minimal yet refined shades provide protection against UV rays and sun glare, without compromising views or style. Multiple opacity levels allow you to cover your windows with the right amount of sun protection. Solar Shades can also be combined with sliding panels to create a uniform look throughout any room. 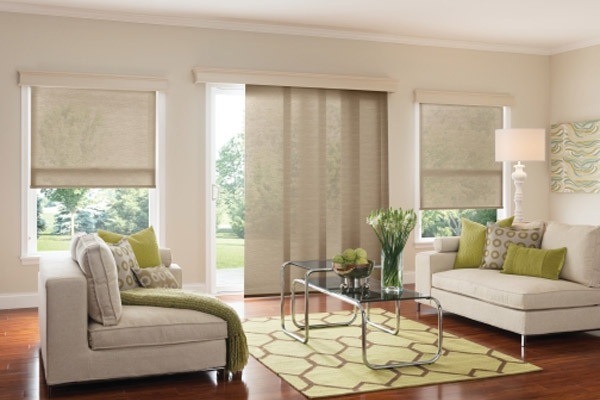 With a touch of a button, motorization allows you to raise or lower all of the shades in your living space. Allow Solar Shades to bring the beauty of the outdoors in.